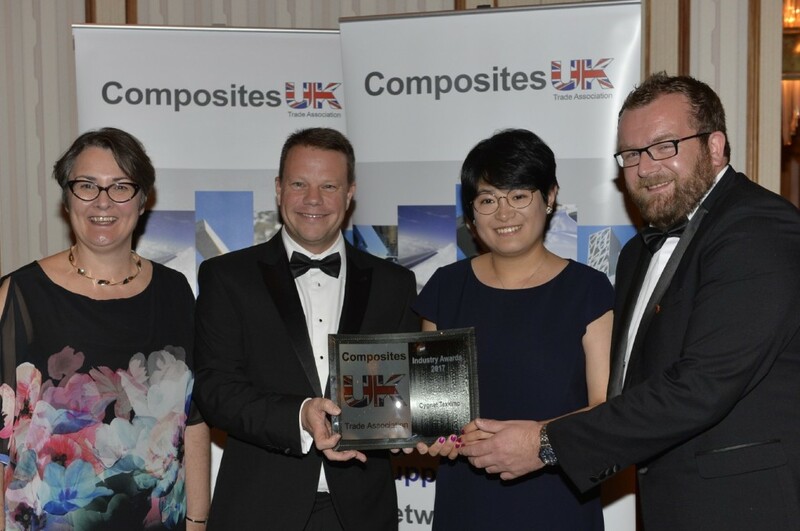 Cygnet Texkimp has been awarded the UK Composites Innovation of the Year Award at the Advanced Engineering show at Birmingham’s NEC. Machinery manufacturer and fibre handling specialist Cygnet Texkimp won the award for its 3D Winder technology, which is the world’s first robotic 3D winding machine capable of making complex composite parts with non-linear axes and varying cross-sections. The technology is being developed as part of Cygnet Texkimp’s KTP (Knowledge Transfer Partnership) with specialists from the University of Manchester and is based on the 9-Axis robotic winding concept first developed by university professor Prasad Potluri. Cygnet Texkimp employed PhD graduate and composites academic Dr Yan Liu to lead the two-year project. The 3D Winder can quickly and precisely lay down multiple carbon fibre tows and can accurately follow complex curves and corners. It is capable of laying down high volumes of fibre at much faster deposition rates than similar technologies such as braiding and weaving. Multiple tows of up to 50,000 filaments each can be laid down at once and trials have shown it has the potential to wind an aircraft spar in a few minutes. Its market potential is considerable because it responds to one of the biggest gaps in the composites market – how to create composite components cost-effectively in high volumes and at high speeds. As a result, it has clear value to add to the high-volume mainstream automotive and aerospace markets, where it can be used to manufacture a wide range of components including fuel pipes, cant rails, bumpers and wing spars.